Is this the second photograph of the new century? To ponder that question we have to go back to the very beginning. In the book of Genesis the story is that each day after the creator did his creating, he stepped back, looked and “saw everything that he had made, and behold, it was very good.” By giving us a god’s-eye view of human-made terra firma, this photograph of two human jetpacks flying in formation over Dubai’s Palm Islands testifies to the way old mythologies are carrying us into the future. It’s as if this photograph catches humanity admiring its own awesome powers of creation, holding the image up to itself, and after surveying yet another spectacular accomplishment—maybe the grandest of them all—quietly admitting: damn, I’m good. Whether you think human flight or a synthetic palm tree island is the grandest accomplishment, both feats of ingenuity equally testify to our stubborn insistence that we can, so long as we get the engineering right, rise above the level of nature. And that kind of hubris is an old story indeed. 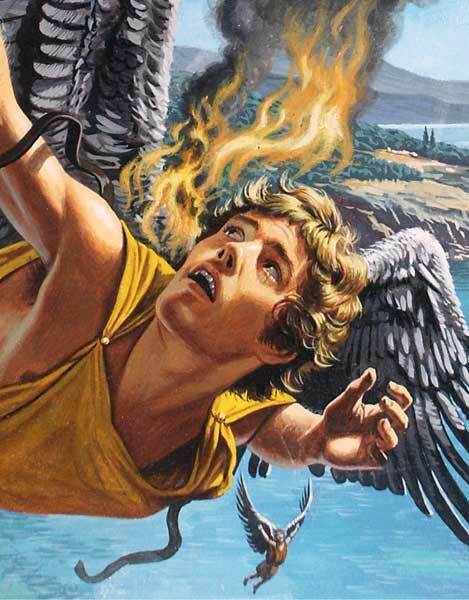 Looking at those two winged creatures over Dubai, I think of brash Icarus who flew too close to the sun. If the new century has us seeing in terms of transformations of the global environment, then this photograph demonstrates how old sensibilities push us onward and upward until we’ve maxed out how much we can do on this planet. We may be operating along old, old story lines, but for all intents and purposes the space age is here. What looks now like a shining moment in lifestyles of the rich and dangerous may, fifty years down the road or so, strike us as just another threshold on a long dry run to Mars. (photo: Lara Sukhtian/Reuters. caption: An aerial view taken from a sea plane shows Swiss pilot and original Jetman Yves Rossy (front) and Vince Reffett over Dubai’s Palm Islan, Dubai, United Arab Emirates May 12, 2015).